President Donald Trump shakes hands with Chinese President Xi Jinping during a dinner at Mar-a-Lago, April 6, 2017, in Palm Beach, Florida. 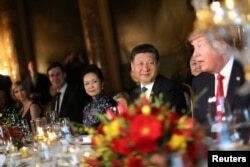 Xi did not make remarks while reporters were in the Mar-a-Lago dining room, and Trump did not answer questions about Syria or North Korea directed at him by journalists. Earlier, Trump and members of his administration made it clear they hope to pressure Beijing into doing more to rein in North Korea’s nuclear weapons development. Chinese President Xi Jinping and First Lady Peng Liyuan attend a dinner hosted by U.S. President Donald Trump at Trump's Mar-a-Lago estate in West Palm Beach, Florida, April 6, 2017. In remarks to reporters aboard Air Force One, Trump said the roughly $310 billion U.S. trade deficit with China is high on the agenda. But he also appeared to link that issue with U.S. concerns over North Korea’s nuclear weapons program. “The other thing, of course, is going to be North Korea, and somehow they will mix. They really do mix. So we’re going to be talking about trade, North Korea, and many other things,” he said, without elaborating. A working lunch also is on the agenda for the two leaders Friday. Earlier this week, Trump warned, “If China is not going to solve North Korea, we will.” His administration is considering sanctions against Chinese banks and companies that give Pyongyang access to international financing. China supplies North Korea with almost all its fuel oil, imported foods, consumer goods and the raw materials used to construct its weapons program. But China also has grown weary of the militaristic aspirations of North Korean leader Kim Jong Un, who has yet to visit Beijing during his six-year rule. A series of U.N. sanctions against North Korea have not deterred it from a string of missile tests, the latest this week. Trump and Xi, who oversee the world’s two largest economies, are meeting for the first time. On Wednesday, Trump said dealing with North Korea’s nuclear development program could have “been made a lot easier if it was handled years ago.” But the U.S. leader, in office less than three months, said he welcomes the challenge. “We have a big problem; we have somebody that is not doing the right thing, and that’s going to be my responsibility,” Trump said. According to advance thoughts on the summit from Beijing, Xi could offer the United States more Chinese investments, which would create more American jobs, a key Trump campaign pledge. Under former U.S. President Barack Obama, Chinese American relations often were focused on curbing greenhouse gas emissions in the two biggest polluting countries in the world. But Xi and Trump have taken sharply divergent paths on curbing pollution. The Chinese government recently canceled construction of more than 100 coal-fired power plants and is investing at least $360 billion in green energy projects by 2020.Trump, meanwhile, has vowed to bring back mining jobs that have been lost through automation and closure of U.S. mines, as the country has turned to the use of cheaper natural gas. Trump in the past has described global warming as a hoax perpetrated by the Chinese to hurt the U.S. economy. Last week, he signed an executive order aimed at rolling back Obama-era policies regulating carbon emissions. China expects Trump to reaffirm a pledge that was made by Secretary of State Rex Tillerson last month, during his visit to Beijing. “The two presidents are going to define the nature of the relationship between China and the United States as characterized by this phrase: no conflict, no confrontation, mutual respect and win-win cooperation,” said Wang Dong, a political scientist at Peking University. Wang said China hopes the informal get-together will inject some stability into the relationship and help reduce the uncertainties that have arisen during the transition to the new administration.